At SGS Engineering we have a range of transformers and splitters available from a trusted brand; Defender. Available to order online is the E13104 Distribution Unit ideal to use to turn a single 16amp outlet into 4 x 16amp outlets which allows 4 different 16A applications to be connected at any time. The distribution unit can easily be transported with the carry handle and is tough and reliable. 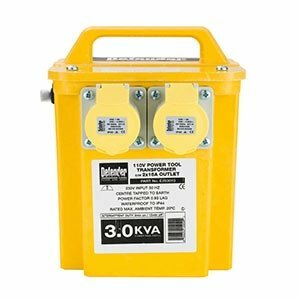 Also available is the Defender E203010 Transformer which is great to use on job or work sites to convert 240V input electricity to 110V. The transformer is designed to be used for demanding construction tasks and for industrial 110V appliances. When it comes to transformers and splitters, at SGS Engineering, we’re certain we have the right products for you. For example, any professional tradesperson who regularly operates power tools will find that our Defender 3Kva transformers and power distribution units are a fantastic choice. So browse our selection today to find the right transformer or splitter for you. Built by Defender and finished in a bright yellow colour, the transformers and splitters we sell offer safety and high performance. Designed to handle even the most challenging of jobs, they are ideal for use on construction and job sites. You could opt for the Defender Distribution Unit / Splitter Box 4-Way 16A, a lightweight, portable power distribution unit complete with handle and four 16A outlets. Cased in steel, this 110V splitter box has been created for endurance as well as performance, delivering on all fronts. Or choose the Defender Transformer 3Kva 2x 16A, made for industrial power tool use. This Defender 3Kva transformer has a 110V output (converted from 240V), has been built for reliability and is able to withstand the toughest jobs. These defender units are supplied with 2 metre and 3 metre cables. As such, don’t forget to browse our extension leads, to help you be more mobile. We sell Defender 16A extension cables on our website, to help you get the job done. So take a look through our collection and purchase your new 3Kva transformer or power distribution unit today. If you’re ordering to a UK mainland address, checkout before 4pm for next day delivery. Check here if we can deliver your order for free! If choosing the right generator seems like a daunting task, take a look at these useful guides we've put together which can tell you everything you need to know about our range (including how they work and how to use them) to help you make the right choice. Take a look at our Generator Buying Guide that can help you work out which generator you need. - Find out how to set up and start a petrol generator. How Much Can Your Generator Power? - Learn more about how generators work and what they can be used to power.